I Do Have My Eye on the Prize! 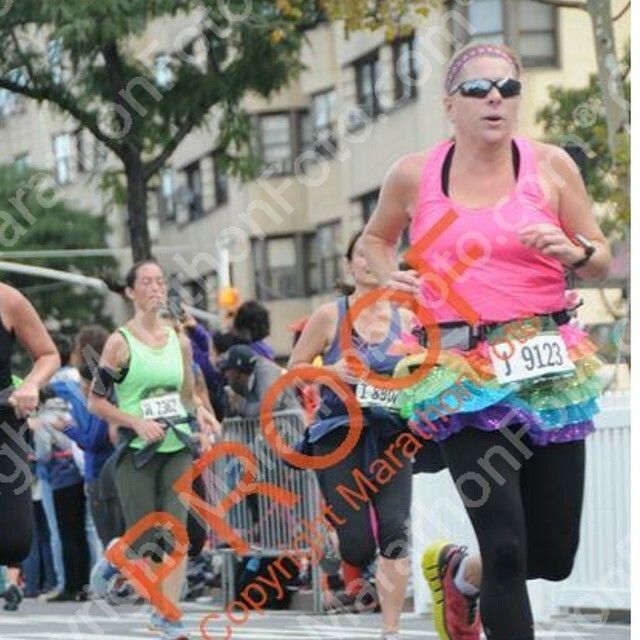 Well I am getting close to the finish line of both my marathon training and my quest to complete the 9+1 to get into the 2016 NYCM. Both have become equally important to me and I want them both. Yeah, I’m like that. 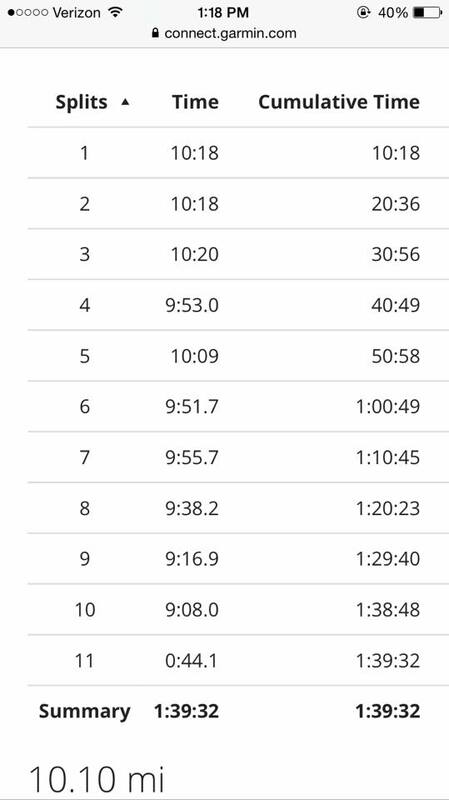 Yesterday, I had the Bronx 10 Miler which I actually thought would fit very nicely in my training plan, but do to a hiccup in my schedule did not. I still needed to do it though because it was race number 8 out of 9. In talking with my coach, it was decided that I would push back my l6 miles long run a day till Tuesday. This is an important run as 12 miles with any luck will be at my goal marathon pace of 9:50 to 10:05. So it was determined that I would do Bronx slow and steady. My mantra was to be, “This is not my goal race.” I was told to keep my eye on the prize. Was I disjointed that I wouldn’t be racing Bronx. You bet. Did I want to race? Maybe a little:) But I knew what was important. I was going to keep my eye on the prize. I lined up with my friends, but told them all I would see them at the finish line. Dawn was planning to push it and I was so excited for her, but I knew that we wouldn’t be able to run it together and besides she didn’t need me. Initially I thought about starting in a slower coral, but I wanted to start with my friends. When the race started, I started slow and steady. I ran the first 3 miles around 10:15, but I really wasn’t paying attention to my watch. I even stopped to take a picture around mile 5. I was not pushing it or at least I didn’t think so. Then I ran into a woman and her husband that I’ve met at several races through a mutual friends. I decided to run with them. Slow and Steady. We literally were chatting the whole time. I wasn’t paying attention to the time. I just was running. Slow and Steady. Conversational pace. We cross the finish line together. 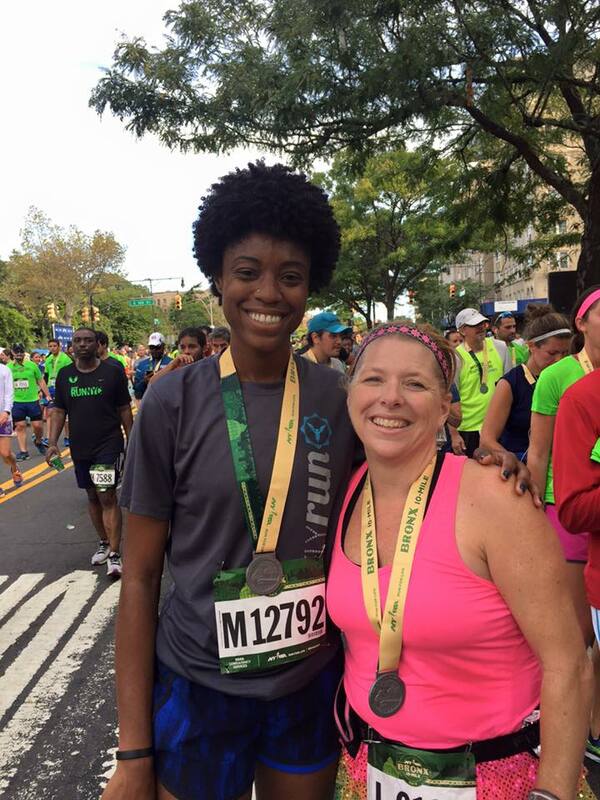 I even meet an online running friend from the group Runners United NYC. I recognized her from her beautiful hair and went up to her and asked if she was ConfidentCurls and introduced myself as Accidentally Running Mama. Yes, just like that! Then we take a picture together and until meeting her in person I did not realize how tall she was as I already knew how short I am. 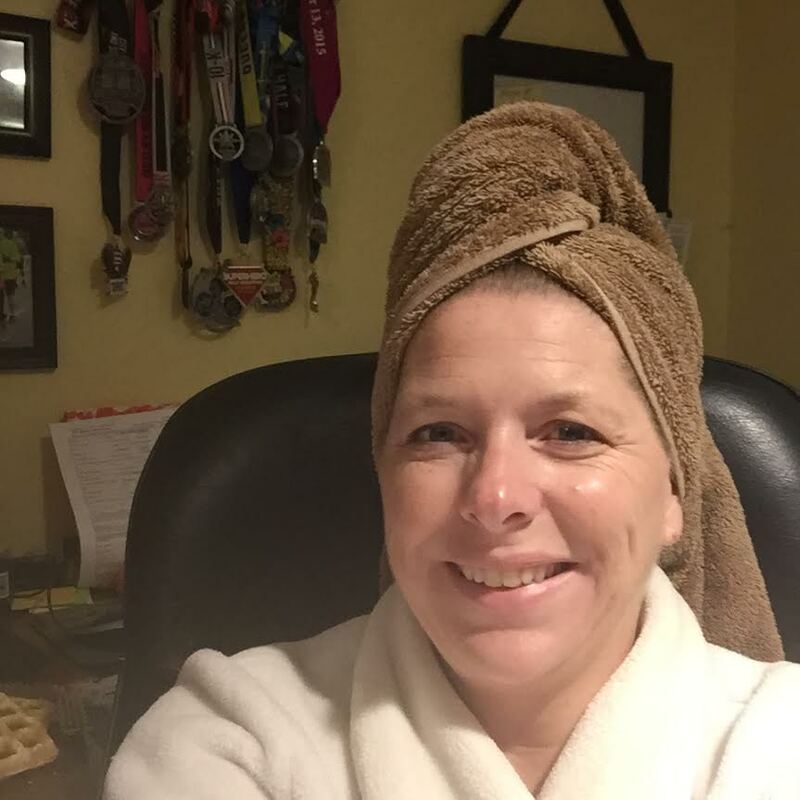 It amazing how inspiring people can be that you’ve never met in person and there are actually a few that I only know online that I can’t wait to meet in person at the Marine Corps Marathon! Then I meet up with my Mom’s Run This Town Mama’s. Excited to hear how they all did and that Dawn ran the race that we all knew she could run. Yeah, Dawn!! That is until she tells me that I’m going to be in trouble. She points out that I did exactly what she knew I would do which was not do a slow jog. Then I look at my time and realize that she may be right. I get home and look at my splits and although VERY pretty were not on the agenda for the day. They are pretty. Aren’t they? Dawn laughed because she pointed out that my coach has me so well trained I do negative splits without even trying. There may be some truth to that, but I also know that every run is not this pretty. The truth though is that my coach has trained me so well that I was running this race at a faster pace, but I felt good doing so. I, really, was chit chatting away. I did not feel out of breath. I did not feel like I needed to stop. I was just plugging away. Now, maybe I should have paid more attention to how fast I was plugging away, but I really didn’t feel like I was pushing myself. Although I will admit that when I was getting close to the end, I did take it up a notch. Yes, I am one of those people that no matter the race or the pace; I will give it all I’ve got at the end. Makes for nice picture though. Don’t you think? So now today is a Rest Day. I will respect the rest day. I will honor it and keep it holey. Ok, maybe not that far but pretty close. Seems like I’m starting out on the right foot anyway. Because I do know that the only way I will not be in trouble with my coach is if I nail tomorrows Long Run. Yes, I do know that I am a grown woman who can do what I want when I want. That being said, the reason that I have a coach is to listen to her guidance and the things she tells me. She really is much smarter and wiser than me in the ways of running. She didn’t accidentally start running. So rest, relax, and carb load today. 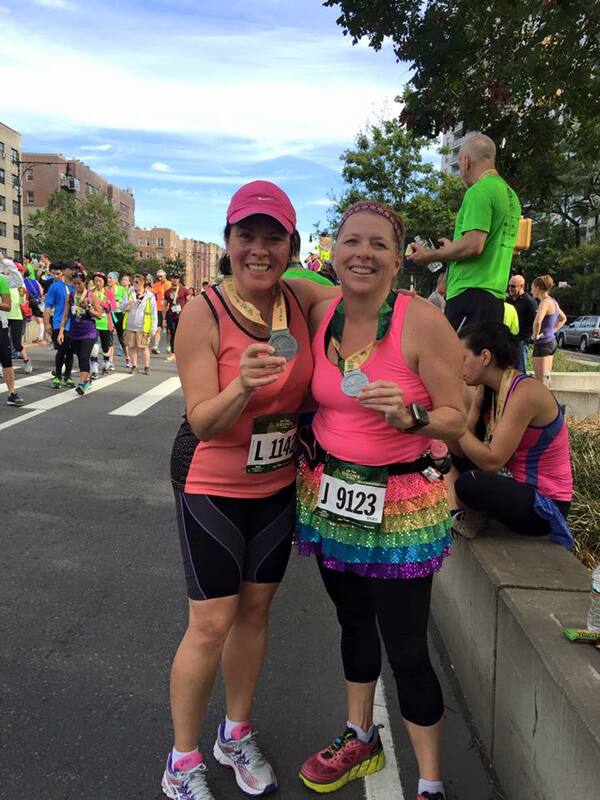 Do you have Running Friends that you’ve never met in person? ← I See You. Do You See Me? Great job at your race. A nice training run for MCM. There are several people I consider “friends” thru blogging that I never actually met. It’s always nice to meet them in person at races.